Immense coils of hot, electrified gas in the Sun’s atmosphere behave like a musical instrument, scientists say. The corona is an atmosphere of hot, electrically-charged gas – or plasma – that surrounds the Sun. The temperature of the corona should drop the further one moves from the Sun. 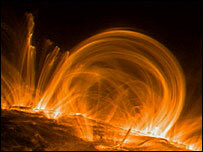 But, in fact, the coronal temperature is up to 300 times hotter than the Sun’s visible surface, or photosphere. And no one can explain why. The coronal loops arch hundreds of thousands of kilometres above the Sun’s surface like huge fiery fountains, and are generated by the Sun’s magnetic field. These blasts can send immensely powerful acoustic waves hurtling through the loops at tens of kilometres per second, creating cosmic “organ music”. “These loops can be up to 100 million kilometres long and guide waves and oscillations in a similar way to a pipe organ,” said Dr Youra Taroyan, from the Solar Physics and Space Plasma Research Centre (SP2RC) at the University of Sheffield. The Royal Astronomical Society’s National Astronomy Meeting in Preston runs from 16-20 April.